This early green and orange label does not have the Warner logo at 3 o'clock, this came later. There are no symbols on the top half of the label ( the later presses had the 4 symbols in this area). 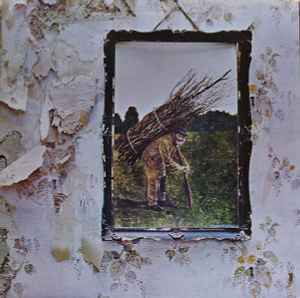 Commonly referred to as “Led Zeppelin IV”, to follow in sequence with the previous two numbered albums. I have one small issue about the year of this LP. Most of the information here matches to the record I own. Mine also has "Misty mountain Top" printed on side B rather than "Misty mountain Hop". Cat - K50008, Porky/perky run outs, stairway lyrics on inner sleeve, does have Kinney Music/Superhype, green/orange labels, made in UK. Anyone else have similar info on their pressing ? Any chance this is a first press ?